The first time I ever laid eyes on McIntosh speakers was at a stereo shop in Northern Virginia where I grew up. By buying this product you'll earn up to 5000 Rewards points. The first time I ever laid eyes on McIntosh speakers was at a stereo shop in Northern Virginia where I grew up. The salesman there was kind enough to play them for me, but as a high-school kid with limited funds they were way out of my league. Still, I've never forgotten how amazing they looked and sounded. When I found out McIntosh would be partnering with Crutchfield, it instantly took me back to that stereo showroom from long ago. Although their designs have evolved over the years, the beauty and natural, balanced sound of McIntosh speakers have remained unchanged. 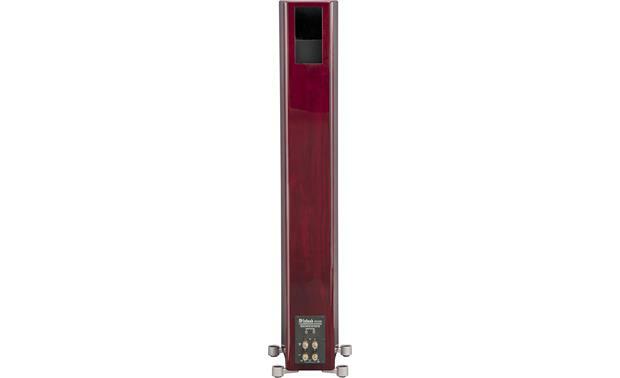 The slender XR100 tower exemplifies just how skillfully McIntosh blends traditional craftsmanship with advanced engineering to create a speaker of enormous depth and power that can enhance the look of even the most elegant room like a fine piece of furniture. The McIntosh XR100's unique midrange/tweeter array delivers spacious, wide-open sound. One look at the XR100 immediately tells you it's something special. For starters, the speaker's upper-frequency drivers are all mounted to a solid, 5/8"-thick machined aluminum baffle for ultra-precise alignment. McIntosh nestles the XR100's 3/4" titanium dome tweeter between ten 2" inverted dome midrange drivers for a smooth, even response pattern with spacious imaging and soundstaging. This large, multiple driver array also provides increased power handling, plus greater dynamic range and output with less distortion than a single, larger diameter midrange driver. The XR100's deep, powerful bass comes courtesy of four patented McIntosh 6" LD/HP® (Low Distortion/High Performance) woofers. Compared to conventional woofer designs, these drivers feature an advanced magnetic circuit that significantly reduces distortion while increasing power handling and efficiency. Their rigid, die-cast alloy baskets, four-layer copper voice coils, and polypropylene cones with rubber surrounds act as a near-perfect air piston for fast, articulate bass and superb transient response. McIntosh builds each XR100 enclosure with non-parallel internal sides to reduce distortion caused by internal standing waves. Multiple front-to-back and side-to-side braces form a rigid, well-dampened structure that resists performance-robbing vibrations. The cabinets are then completed with premium, real wood veneers with a high-gloss finish for a stylish, modern appearance. McIntosh tops off each speaker with an attractive magnetic grille that features invisible attachments to give the XR100 a clean, streamlined look when you remove it. 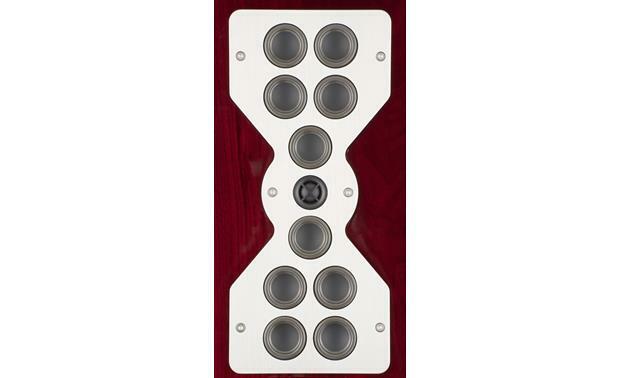 Plus, this speaker's front-panel McIntosh emblem can be proudly illuminated by connecting the back-panel Power Control input jack to a compatible McIntosh component. 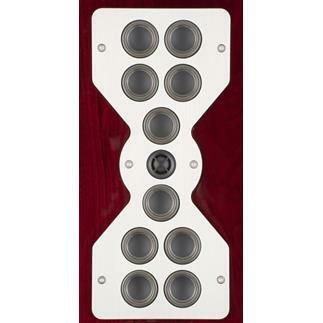 11 Upper Frequency Drivers: McIntosh's XR100 floorstanding speaker utilizes 11 upper-frequency drivers. There is one 0.75" titanium dome tweeter and ten 2" midrange inverted titanium dome drivers. The tweeter and midrange drivers are precisely aligned on the precision machined mounting plate of 0.625" inch thick aluminum. Their unique layout and crossover design combine high power handling with precise sound-staging. Locating the tweeter between the multiple midrange drivers generates a symmetrical polar response for superior imaging. Since the audio power is distributed among all the drivers, each driver does not have to work as hard, resulting in greater power handling capability, dramatic reduction in distortion, and greater dynamic range. Multiple Midrange Drivers: Eight of the ten midrange drivers reproduce the lower two octaves of midrange, while the remaining two midrange drivers reproduce the upper two octaves of midrange frequencies and are located directly adjacent to the tweeter. 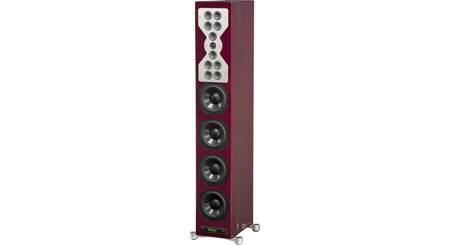 This type of design maintains wide dispersion with a stable sound image throughout the upper midrange frequencies. There are several benefits when using multiple Midrange drivers. First, there is a substantial increase in power handling capacity far greater than a single larger diameter midrange driver. Second, due to mutual acoustic coupling there is an increase in output volume while at the same time a reduction in audible distortion. 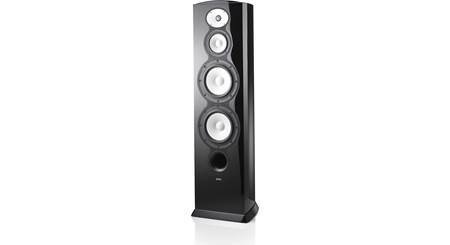 Neodymium-Iron-Born Alloy Magnets: The 0.75" tweeter and ten 2" midrange drivers all employ a neodymium-iron-born alloy magnet. Neodymium-iron-boron alloy has the highest flux density per unit of volume. This allows for a smaller physical size driver and thus closer driver-to-driver placement for improved dispersion. 4 Patented LD/HP Woofers: The low frequency section of the XR100 floorstanding loudspeaker consists of four newly designed McIntosh patented LD/HP 6" woofers. These four McIntosh patented LD/HP woofers offer increased power handling and produce incredible deep bass with low distortion. Each woofer features a polypropylene cone with a rubber surround and has a four layer copper voice coil, so it can perform as a near perfect air piston. The rear vent through the magnetic assembly offers improved heat dissipation. The die-cast basket has an open air area under the voice coil/spider assembly to prevent displacement noise. All together these advances in woofer design construction and materials produce the very important first several octaves of music, with a high degree of accuracy and superb transient response. Precision Crossover Network: The crossover network used in the XR100 loudspeaker is designed to ensure an even frequency response over the entire audible range. The 2nd order designed network utilizes capacitors and inductors with high-current capacity. The Capacitors used are the low loss (ESR) types. The low-loss (DCR) inductor used in each section of the crossover network has been chosen for high linearity, even at high power levels. This prevents distortion of the music at any frequency. The crossover network also utilizes self resetting high current PTC fuses to provide an extra measure of protection. 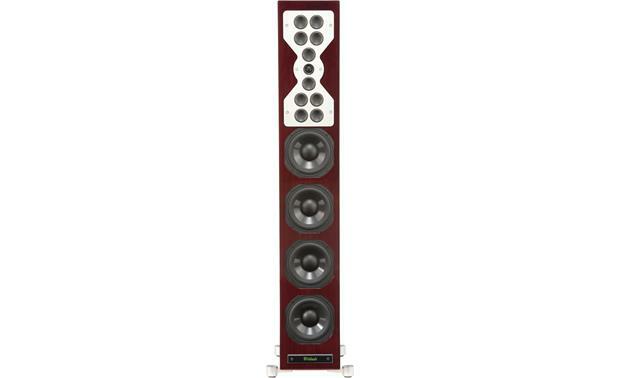 Bass Port: The McIntosh XR100 floorstanding speaker utilizes a vertical port with a rear opening to increase bass output, reduce distortion and improve the overall efficiency of the loudspeaker. Real Wood Veneer, Rigid Enclosure: The XR100 loudspeaker enclosure is constructed with non-parallel internal sides to reduce internal standing waves. It has multiple front-to-back and side-to-side internal braces to form a dampened rigid loudspeaker enclosure. The XR100 is available in various real wood veneers with a high gloss polyester finish. Fine gloss wood finishes are offered in Black or Red Walnut. These high-gloss finishes and fine cabinetry will be a welcome addition to even the most elegant homes. Magnetic Grille: The custom designed molded loudspeaker front grille is covered with a neutral black cloth and is secured to the speaker cabinet using neodymium magnets. The magnetically attached grill exhibits nearly perfect acoustic transparency. 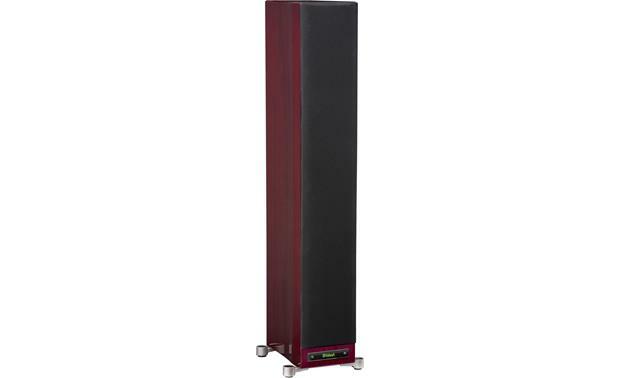 The design of the XR100 loudspeaker took into account the acoustic characteristics of the front-panel grille and it should be attached to the loudspeaker for the best sonic performance. Dual Gold-Plated Binding Posts: The McIntosh XR100 is equipped with dual sets of McIntosh Patented gold-plated, binding-post terminals so you can bi-wire or bi-amp the speaker. These binding post terminals will accept large diameter wire (up to 10AWG), banana plugs (single only), and spade lugs. Mounting Feet: The XR100 floorstanding speaker's four mounting must be installed for optimum sound and proper stability. The mounting feet attached to the bottom of the speaker cabinet using the included hardware. You also have your choice of four glides or tiptoes, which screw into the bottom of the mounting feet. The glides are ideal for protecting your tile or hardwood floors, while the tiptoes provide better stability for carpeted floors. Applications: The McIntosh XR100 floorstanding loudspeaker is sleek and contemporary in appearance while producing full-range audio sound. 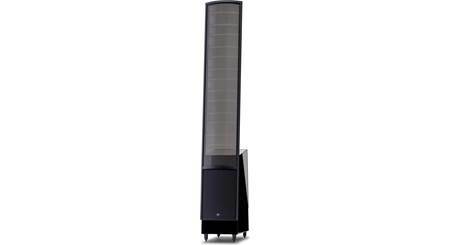 The XR100 floorstanding loudspeaker is designed for both music and home theater systems, and can fill large rooms with full-bodied sound. Amplifiers from 75 to 600 watts are appropriate power for the XR100 speaker. 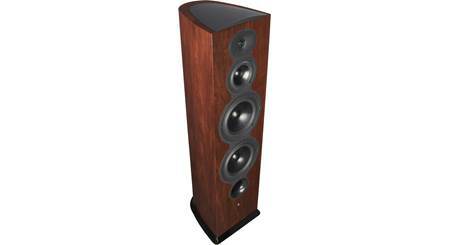 Placement: Loudspeaker placement in a room can greatly affect performance. Placement near a wall, corner, or any intersecting surfaces will reinforce or diminish some bass frequencies. Try various locations by listening to music containing continuous bass and finding a location where there is an over all musical balance in the sound and the bass content does not dominate. There should be an unobstructed area in front of the Loudspeaker of at least 30 either side from the center axis for the best performance. The distance between the loudspeakers and the listener to the loudspeakers should form an acute isosceles triangle. If the speakers are too far apart relative to the listener, some imaging can be lost. Front-Panel Logo Illumination: The even Illumination of the front-panel "McIntosh logo is accomplished by the combination of custom designed light diffusers and extra long-life light emitting diodes (LEDs). Power Control: The Power Control Input (3.5mm) supplies power to illuminate the XR100's McIntosh Logo, while the Power Control Output (3.5mm) supplies power for remote turn-on of additional Components. Loudspeaker Protection: The XR100's built-in speaker protection incorporates four automatic resetting solid-state devices in the crossover network. One protects the tweeters, one each for the low and upper midrange drivers and one for the woofers. Is it really this necessary to have all these speakers? This is not a pair, but separate; correct? Figure 5 of the owners manual shows the shape of a distortion versus frequency curve but without values or further explanation. Where can I find this information? Can a 200 amp give enough power to drive the speakers? Searches related to the McIntosh XR100 Floor-standing speaker.